Looking back at Sony during 2012 and looking at it now in 2014, it’s impossible to deny how holistically it has turned around the public perception of PlayStation. Through calculated messaging, a consistent appeal to the right audience, and recently, a dash of nostalgia and celebration of its history, Sony has put the PlayStation brand back on top in the minds of much of the industry. During 2012, there was still a belief that PlayStation 3 was the underdog to the Wii and Xbox 360’s success (despite being pretty much neck and neck with the latter during the second half of the generation), but even so, the company decided to reveal a crossover brawler reminiscent of Nintendo’s Super Smash Bros. called PlayStation All-Stars Battle Royale. The game wasn’t the raging critical success its clear inspiration was, but the game received good-to-decent reviews and managed to sell somewhere around a million copies across PlayStation 3 and Vita. Despite good-not-great reception and similar sales, Sony did opt to sever ties with developer SuperBot Entertainment, who had been working on DLC for the game, not all of which ever made its way to the PlayStation Store. When All-Stars was in development, I assumed that the game would be a huge event for the PlayStation community, one that would bring all types of PlayStation fans together to play as their favorite characters. That’s typically the reaction Super Smash Bros. gets, right? Sony has a great cast of characters that could make up a crossover brawler, but now that Sony’s on top in the console war, they’re best equipped to try again. The loudest and most consistently seen complaints toward the game were the comparisons it was constantly getting to its inspiration, Super Smash Bros. In some ways, PlayStation All-Stars is a much stronger technical fighter than Smash Bros. The game has a decided emphasis on strategy, and its roster is varied in a way that each character requires dedicated time to mastering in order to really get much out of them, where Smash Bros. is much easier to pick up and play. But despite its mechanical differences, much of the people playing All-Stars thought they were getting a palette swap of Smash Bros. with PlayStation characters, often mistaking the differences for inferiorities. 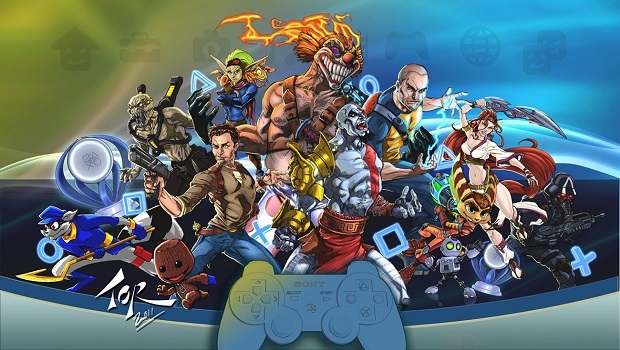 The roster also suffered due to a desire for third parties to use the game as a playable ad rather than the tribute to PlayStation history that the game was initially pitched as. Characters like Metal Gear Solid’s Snake were forsaken while Raiden made an appearance in anticipation of Metal Gear Rising: Revengeance, and the rebooted version of Dante from Devil May Cry took the spot clearly meant for the original character. The game’s last DLC pack featured Isaac Clarke from Dead Space, who had no business being in the game other than the fact that he originated from a game that was on the verge of releasing its third entry. But most of all, All-Stars was often looked down upon because of Sony’s perceived standing in the console war. The PlayStation 3 easily had the shakiest launch until it managed to get back on its feet midway through the generation, but the stigma still stuck with the system for years to follow, even six years later when PlayStation All-Stars Battle Royale was announced. When asked about the potential of a sequel to PlayStation All-Stars, Sony’s Shuhei Yoshida told IGN that one should “never say never” regarding a future for the All-Stars franchise, and that a follow-up could happen one day. Well Sony, I think now is the time for a sequel to PlayStation All-Stars Battle Royale. I attended Sony’s PlayStation Experience this weekend, and it was essentially a massive bonding experience for the most fervent and dedicated PlayStation players. It was an event being held for a brand celebrating 20 years of games, characters, and community. Here, I saw one of the most passionate fan bases in the industry coming together for a system they’d been playing for years, and it highlighted how Sony has been so steadily outpacing its competition since the reveal of the PlayStation 4: they have the right message and their community-centric persona is bringing in players from every gaming background. Sony is, undeniably, on top, and that’s why PlayStation All-Stars 2 could be the success that the original wasn’t. PlayStation 4 is in a position where an All-Stars sequel doesn’t have to worry about the comparisons to its competition, has the respect that it needs to have a proper roster that’s not filled with characters who aren’t meant to be there, and has the public backing to avoid the stigma the original game carried like a ball and chain. Plenty of new characters have joined the PlayStation brand since the original All-Stars. Delsin Rowe, Knack, Sir Galahad, and, if Sony could make it work, Joel and Ellie could all make appearances in a sequel. Celebrating the PlayStation’s first 20 years has been the subject of much of Sony’s marketing push this year, which is why I had a gut feeling that a sequel to the crossover fighter could have been announced at the event’s keynote. This never came to be, but Sony’s celebration of its history has me convinced a new game that brings together PlayStation’s huge selection of characters could be on the way. If so, I hope Sony does whatever it has to do to make sure the sequel is a proper representation of the brand’s timeline, and not an ad for third parties to arbitrarily throw in characters and levels that are just meant to showcase upcoming games. Let’s see the addition of newcomers Knack, Delsin Rowe, and Sir Galahad, as they fight classic characters from across PlayStation’s first 20 years. PlayStation All-Stars Battle Royale was a great proof of concept, and it’s time for Sony to really sell us on the idea of these two decades of characters and worlds coming together. They’ve already shown that they can get fans rallied around the idea of a dedicated event, let’s see them bring something as meaningful as Smash Bros. in a time where they’re most well-equipped to do so.